We’ve driven from Indiana to Colorado to get our Baby each time! I can’t say enough wonderful things about Jared & Karen & their Rocky Mountain Biewer Terriers. They have a beautiful, spotless log house home near Dolores, CO, where the dogs spend their days romping, exercising & enjoying the sunshine & fresh mountain air in the huge fenced-in play area behind their home. They have doggie doors that are always open so the dogs can go in and out as they please. I could watch them all day! They even have little wooden log dog houses in the back as playhouses for the dogs. The dogs run in and out and some even take naps in them when the weather is good. Each log dog house has a large heat pad, connected to a doggy safe outlet. Now that’s living!! These dogs eat better, live better & are groomed better than most people I know! I actually felt bad when we left there with our first dog, knowing I was taking her away from such a wonderful home, which is completely the opposite from what I’ve felt with the dogs we’ve got in the past from other breeders. Karen even gave us a ziplock bag full of shredded boiled chicken because that’s what our dog liked for a snack. It is so much fun seeing all the Rocky Mountain Biewer Terriers in person…and yes, they’re just as beautiful in person as what you see on their Website & Facebook Page. Each dog has its own unique colorations, markings & personality, yet they’re all beautiful, healthy, well cared for & well socialized. This 3rd time we went there, we got to see all the puppies (except the newborns) and they were gorgeous! Their new Mommies & Daddies are going to be over the moon happy when they meet them for the first time!! We got our first little girl from Rocky Mountain Biewer Terriers in December 2015, went back in March 2016 for our little boy & back again a week ago for our 2nd little girl. All 3 of our dogs are beautiful, healthy & well socialized & handled the long, several days’ road trip from CO to IN like champs. No whining, no crying, no car sickness…they adapted instantly & felt like they’d been a part of our family forever! 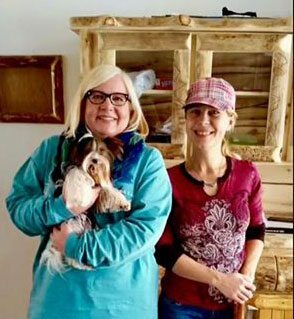 I’ve become friends with some other “parents” of Rocky Mountain Biewer Terrier pups & they too are so pleased with their “babies” & the experience they had, that they wouldn’t dream of getting another Biewer Terrier anywhere else. Karen is always great about answering any questions I’ve ever had & always returns my texts or calls, even over a year later. The Hansens are an amazing, hard-working young family who has put so much into establishing their kennel & producing dogs of excellent quality that maintain the highest of breed standards. Their dogs are all DNA tested, Breed tested, vet checked & microchipped and I would highly recommend Rocky Mountain Biewer Terriers to anyone looking for a Biewer Terrier. I know I’d never consider going anywhere else. We cannot be more pleased with our little guy Sir Vance. Karen & Jared were so nice and welcoming when we went to their beautiful home to meet them and our new family member. We were able to play with some of the adult Biewers and they were all very clean and very well cared for. Our little guy was very well adjusted. You can tell without a doubt that both Karen & Jared give the best care to their babies and truly love what they do! Rocky Mountain Pomeranians is 100% legit and provided us with a happy, healthy Pomeranian puppy that we have fallen in love with. Our experience was easy and they made sure to send pictures and videos leading up to the date and flight of our baby girl. They are a professional company, are true to their word, and were a pleasure to work with. I highly recommend them as Pomeranian and Biewer Terrier breeders. We have had very good experiences with Karen and Jared. We have three Biewers from them. The dogs are outstanding. The facilities are top drawer. The knowledge and experience of these well loved and very well kept dogs is obvious in the affectionate gentle nature of the puppies. Very healthy chubby and relaxed-cared for dogs . Karen has remained a wealth of support and teaching for us over the years and that is rare. She is meticulous in her records and pedigrees. Highly recommended! When looking for another companion after losing my yorkie, I found Rocky Mountain Biewer Terriers. I am a breeder of show/performance standard poodles, so I was happy to find a fellow breeder that cared for their dogs. I decided on a Brio Yorkie, named Aspen and couldn't be happier! He has a solid temperament, loving and fun filled! Exactly what I hoped for in my companion.Karen was wonderful in her communication and follow up. Aspen arrived via United and was well groomed and I could tell had been raised with care. He has adjusted quickly to house full of Standard Poodles after being with only small animals. This shows a dog that has confidence and it's a credit to how he was raised!Thank you Karen and Jared for my precious Aspen! Karen and Jared have beautiful, happy and healthy puppies. I was so scared to buy a puppy online and probably seemed a bit paranoid, but they are a legitimate breeder with quality puppies and customer service. When Sir Nico arrived, he was 10x cuter than what any photo could capture; he exceeded my expectations, by far. We will definitely be getting another Biewer from them because now we are addicted. I had a great experience with Rocky mountain Biewer, I have to admit that I was leery of purchasing from someone so far away from me,but I read reviews and did some homework and jumped in. Let me tell anyone reading this, you have nothing to worry about. They are VERY efficient ! These folks have breeding puppies and the business end of it down pat. I love,love,love my new baby and wouldn't hesitate to work with them again!!! Jared and Karen have some very special puppies. My husband and I have both had several dogs before these, and our puppies are some of the happiest, most confident and well adjusted puppies we've ever experienced. We adopted two puppies, a male and a female, from the same litter. They are both very loving, and each has their own personality. 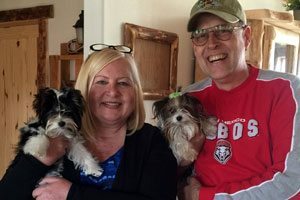 We are very happy with them and just love them.We were fortunate enough to visit their home and really appreciate all the hard work that goes into providing a nurturing and safe environment for all of their dogs, parents and puppies. It was a joy getting to meet all their beautiful dogs. We have been searching to add a new addition to our family for a while, and when I came across Rocky Mountain Biewer Terriers I couldn't have been more excited. They have so many beautiful puppies to choose from it was hard to make a decision on which one to choose. Thankfully, Karen answered all of my questions to help me decide. She was amazing throughout the whole process from the selection of our new little girl Bailey to updates with photos + vaccine status. I can see that she has a lot of puppies with a lot of people asking her questions, but her attentiveness to us felt like we were the only ones she was dealing with and it made the experience personal and easy. We have had our little girl at her forever home for a week now and we couldn't be happier. She is getting along wonderfully with her big brother Riley (also a Biewer Terrier) and is starting to show us her spunky adorable personality. Thank you Karen + Jared for helping us to complete our family! I can't say enough positive things about my experience with Rocky Mountain Biewer Terriers. If you are looking for Biewer Terrier this is the only place to get one. We recently got a beautiful black Pomeranian from Rocky Mountain Pomeranians. Jared was very helpful and friendly throughout the process. He was very flexible and catered to a tight delivery window scheduling the flight that worked best for us. Our Pomeranian arrived in perfect condition in a quality re-usable carrier with plenty of food and water even though the flight was only 40 mins. Jared even followed up the same day to ensure all had gone well. Overall, I could not have had a better experience and would highly recommend them! I was looking for a Show Biewer Terrier. I have bred and shown Aussies for many years. I was able to visit with Jared and Karen at their home in Colordo and look at the puppies and adults. Rocky Mountain Biewer Terriers is a very unique place. I have seen many Kennels and Breeding Facilities but nothing like this ever. Everything is clean, well organzied and taken care of. I will be back to look at my future puppy in Fall 2018. We love our Rocky Mountain Biewer Terrier to pieces. Best pup we ever had. We are in touch through their Facebook Puppy Parent Group and found our Jacob's littermate's and their families. I can only recomend this breeder. Thank you! My wife visited with Jared & Karen 2nd weekend of March 2018. My wife was allowed to sit in the middle of the puppy room that we have been watching for weeks on their Puppy Life Camera on Facebook. All the little puppies tried to climb up on my wife and she got lots and lots of puppy kisses. We had reerved our puppy girl when she was only 4 weeks old but we wanted to look at the other ones availble too, just in case we would like a different puppy better. We went home with the one we had chosen online. She was just perfect. You would never imagine how small these puppies are. They appear much bigger on their photos on teh website and on Facebook, but once you sit in front of them they are just so tiny. My wife was in tears, it was very emotional. Jared & Karen are super nice and helpful. We received a puppy folder with lots of documents and information. They gave us product samples and a puppuy blanket. They have a beautiful log home with lots of dog beds and Biewer Terriers all over the place. We had a wondeful time. Our baby girl is all settled in with us now. Our vet loves her and we will come back for a baby later this year. Thank you Jared & Karen with Rocky Mountain Biewer Terriers. We love our Zodiac and everyone else does as well. Thank you for such a lovely puppy, and your services. I’ve recently lost my Yorkie of 13 years due to a heart condition. I wasn’t sure if I was ready for another dog, let alone a puppy. I knew that when I was ready, I wanted a Yorkie, but not your standard color thinking it would help me to not compare. While looking at Parti Yorkie, I stumbled across Rocky Mountain Biewers. I must admit, I was intrigued and did more research. The more I read, the more intrigued I became. Then I saw him! This wonderful little ball of fur, Sir Zorro “Jaxson”. Karen and Jared were amazing through the whole “adoption” process. From understanding my desire to fly across the country to get him and bring him back with me, to my hesitation from just losing my little boy. I can’t say enough about Jaxson. He breathes a new life into an empty home. He’s intelligent (almost too, for his own good), loving, happy and healthy. Karen and Jared, thank you, so much, for this little boy! I will not hesitate, when the time is right, to purchase a playmate! Outstanding dog breeders with outstanding dogs! Healthy, happy, well socialized and exactly as represented. This is a great place to get a Biewer Terrier. I have two and could not be more happy. Karen and Jared raise some amazing dogs! I flew down to pick Miss Emily up from Colorado. She is the nicest, most loyal dog I have ever owned. She follows us around everywhere we go and is always wagging her tail! They have been very helpful throughout the whole process. Would definitely buy another dog from here! About one and a half years ago our family started to look for a puppy. It had been years since our last experience finding a dog. It was my first experience searching online. After 6 months I discovered Biewer Terriers and started to try to educate myself as to this relatively new breed. After browsing through many websites we discovered Rocky Mtn. Biewers and were so impressed with their beautiful dogs. From the first time contacting them to the day our puppy arrived the Hansen’s were professional, organized and a joy to work with. Karen was easy to communicate with whether by phone email or text. Jared and Karen were so helpful through the process, sending everything required (contract, microchip number, health certificate etc.) Everything needed for making the transition comfortable. It was dream come true to have another dog and we are so delighted with our darling Miss Elizabeth (now Misha). Our little mini Biewer is smart, loving loyal and super sweet! Misha is over a year old now and has firmly herself forever in our hearts. We are so grateful to the Hansens for our puppy and we highly recommend them to anyone looking for a Biewer terrier. Just picked up our latest family addition, and are thrilled. Nice folks with an amazing operation! Very healthy pups all over!